Atec’s, Vital Link’s and Celtech’s 130 years of experienced workforce allows us to assemble a hand-selected training team for projects. We use design engineers, program managers, and QA Inspectors who understand and have direct experience with each project. Atec, Inc. has been in the turbine engine test support business since 1953. We have an excellent corporate resume: from personnel to project engineering, from site integration to financial strength, and from company longevity to the most innovative designs in engine test. Our 65 years of experience designing, installing and maintaining engine test systems for both commercial and military clients worldwide is a benefit when training your workforce. Atec can also consult and train company personnel interested in gaining quality certifications. It is our extensive background that gives us the experience and understanding to help with training programs. Atec provides comprehensive training for personnel in the operation, maintenance, and calibration of the test cells. 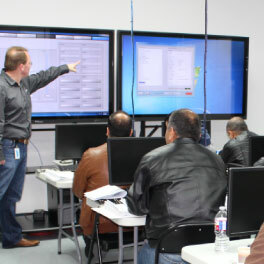 Atec will design a hands-on training program that will be conducted at your facility or location following installation and integration of our test cell systems. Our company will send our test cell experts to train your personnel. Atec will conduct Operator Training to demonstrate the proper operation of equipment and systems required to perform engine testing operations. We have the certified engine run personnel needed for startup and training. Atec will conduct Calibration Training to demonstrate the proper operation of the Data Acquisition and Control System and to perform routine calibration of the system instrumentation parameters. Correlation of test cells is also a service coordinated frequently by Atec Subject Matter Experts (SMEs), often in conjunction with Original Engine Manufacturer (OEM) Experts. Atec will conduct Maintenance Training to demonstrate the proper procedures to be followed in order to maintain the test cells, including a review, spares lists and costumed suggestions to suit each customers unique requirements. Atec provides training on how to operate support equipment and systems, and provides user manuals and recommended spares lists for all of our equipment. Even where our equipment is proprietary, Atec is committed to providing our customer users with information to perform regular maintenance without Atec involvement. Test system periodic calibration is a fact of life. We design automation tools to help the Calibration technicians do their job faster and more efficiently. Our approach has been very well received by many other calibration technicians. Atec provides consulting to companies looking to achieve AS9100 & ISO 9001 Certifications. Atec can help consult and train your company for certifications and a strong quality management system.